From Patterns of Evidence comes the investigative journey of the Israelites, under the leadership of Moses. 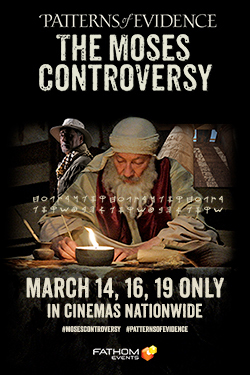 This nationwide cinema event includes an exclusive discussion with the filmmaker and others - March 14, 16, and 19 only. Patterns of Evidence: The Moses Controversy reveals amazing new evidence connected to Moses's ability to write the first books of the Bible and why most mainstream scholars are blinded to that possibility today.